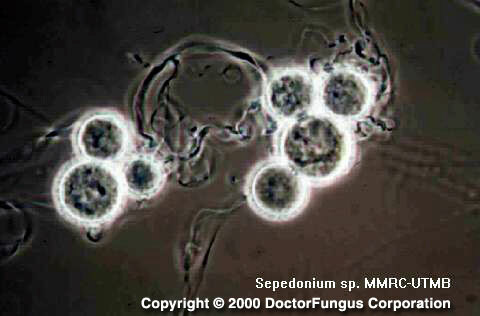 Sepedonium is a filamentous fungus that inhabits the soil and plant material. It is commonly considered as a contaminant. Sepedonium ampullosporum is known to produce ampullosporin, a 15-membered peptaibol-type antibiotic. The most common species of Sepedonium are Sepedonium ampullosporum and Sepedonium chrysospermum. See also our genus & species database for the synonyms and obsolete names associated with the Sepedonium spp. No diseases due to Sepedonium spp. have so far been reported. Colonies of Sepedonium grow moderately rapidly and mature in 7 days. They grow well at 25°C. At 37°C, no or very poor growth is observed. At 25°C, the colonies are waxy and white initially and become woolly to cottony and yellow in time. From the reverse, the color is white . Septate hyphae, simple or branched conidiophores, and conidia are visualized. Conidia are one-celled, large (7-17 µm) and terminally located on the conidiophores. They are solitary, hyaline to amber in color and globose to ovoid in shape. These conidia are typically thick-walled, rough and knobby in appearence, resembling the macroconidia of Histoplasma capsulatum . Phialides and a Verticillium stage may be present. Sepedonium differs from Histoplasma capsulatum by not being dimorphic, not forming microconidia, and not reacting with Histoplasma capsulatum-specific DNA probes. It differs from Chrysosporium by having large, thick-walled, roughened, amber-colored conidia and usually an associated phialidic state.